Time Magazine : Worst Magazine Ever? Tim Magazine is convinced that global warming is going to kill us all. In 1974, they were sure that global cooling was going to kill us all. In 1974, they blamed drought and flooding on global cooling. Now they blame drought and flooding on global warming. 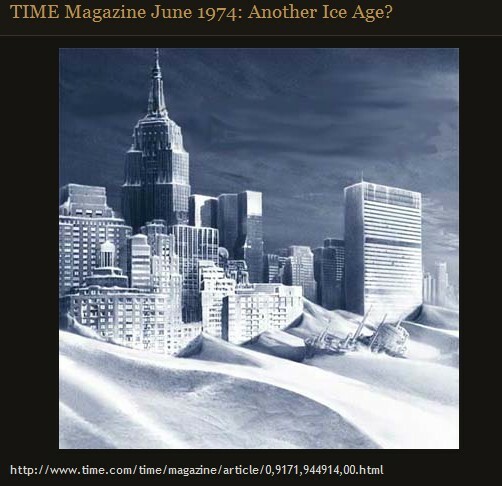 TIME Magazine June 1974: Another Ice Age? 21 Responses to Time Magazine : Worst Magazine Ever? Man, that’s great. I remember talking about that in 4th or 5th grade maybe, and all of us excited at the thought of snowball fights and sledding all year long! Hey , goes to show there’s nothing new under the sun. They were wackjobs then and they are wackjobs now. Yet they are so pompous and dignified in presenting their bs. I really enjoy the laugh I get from hearing them. The flip side is the fact that there are still idiots that believe them. It appears the ratio of wackjobs to sane rational individuals has got worse in favor of the wackjobs in academia and elsewhere. I don’t know if it’s the worst, but it’s one of the worst. I subscribed to Time from the late 1950s until the early 1990s, when I couldn’t stand it any longer. When I didn’t renew my subscription for the first time in over 30 years, I wrote the editor a note that basically said one or both of us had really changed over the years, and that I had a hard time believing what I was reading. The news weeklies like Time and Newsweek are headed to oblivion with the latter likely getting there first. Newsweek was sold be the Washington Post Company to Harman for $1 a couple of years back and now that the old man has passed away, his kids say they won’t pony up money any longer to support the publication. It’s scheduled to transition to an on-line only magazine if a few months. I don’t believe Time is too far behind the Newsweek on that path. Expect the arrogance to ramp up even to higher levels as the end approaches. There are a plethora of candidates for the worst mag ever.Time is part of the lefty, socialist, enviro, commie, marxist, control the world, propaganda machine. If the UN decides it’s global warming, then global warming it is. We are supposed to disregard previous alarmist doomsday announcements. That was like, so yesterday. Yes, Immanent Ice Age compounded with Man-Made overpopulation, over-use of insecticides, nuclear war, et al, spells doom. Circa 1970s – I remember those times well. Catastrophic Global Warming caused by Man-Made CO2 “pollution” spells doom. Precious resources squandered by Mankind; the western world “addicted” to oil, blah, blah,blah. Circa early 21st century. Never read Time. Knew all along it was trash-can liner. Canned both Newsweak and Scientific American after I got wise after ClimateGate 1.0. Recently cancelled my subscription to Popular Science because of silly fact-free Man-Made Global Warming allusions and articles. It is a shame the death of print media. I supported it about as long as I could – for selfish reasons; I enjoy reading just for the sake of reading and do not (ever) look at TV. After I somewhat dramatically and forcefully threw the latest copy of Popular Science in the trash, my dear wife asked why I did so without even looking at the magazine. I simply replied “Global Warming crap”. She asked me if I could just look at it and ignore the GW BS as she has noted I no longer read any magazines and at one time eagerly waited for their delivery and enjoyed sitting at my desk and reading them. She has noted that a source of joy, even if a small joy is gone from my life. It is best not to patronize evil, dishonest ventures. In the early 70s one of my teacher’s was to be married and gifted me several previous decades of Popular Science, Popular electronics and Popular Mechanics. I was in bliss. It is so disappointing to see what has become of the print media. When in America I did enjoy the WSJ and the weekly Barrons paper. pleae let us know what scientific magazines you DO read that don’t publish that Global warming crap. I am sure a lot of us would like to know which are the good ones. Over the last few years I have pretty much given up on print media with my cancellation of Popular Science. I still read a couple of specialized trade journals specific to my profession – things like Vacuum Technology – but now avoid mainstream print media. The internet makes it easy to drop in on different publications as well so who needs the hard copy anymore? Actually I find the decline of print media sad. Magazines and print media provided an outlet for professional writers – some of them quite good and fun to read. Such a pity the profession has fallen so far. The “hair on fire” Malthusians were alive and well in 1974, too! (“Warns Hare, ‘I don’t believe that the world’s present population is sustainable if there are more than three years like 1972 in a row. '”) Zubrin makes the same point as me, only better! (cf. Robert Zubrin, “Merchants of Despair:Radical Environmentalists, Criminal Pseudo-Scientists, and the Fatal Cult of Antihumanism,” [New York: New Atlantis, 2012]). It’s all in the ‘academic inbreeding’. The print & news media writers all nurse at the same liberal, eco-crazed, socialist, higher-education teat. An endless stream of zombies graduates to write an endless stream of pre-programmed thought. Study for years at a monastery, pretty good chance you’ll come out thinking like a monk. I recently go a subscirption for Time as a gift. Even after I did not renew it, they kept sending me new editions and last intallment notices for the next year. I cancelled my Time Magazine subscription to save the planet. So far, it seems to be working — the polar bears are making a come-back. How about a subscription to the all new ‘Once Upon A Time’ magazine? Exactly the same staff and topics but written with more, er, feeling. I’ve never met Tim Magazine but I hate him already.